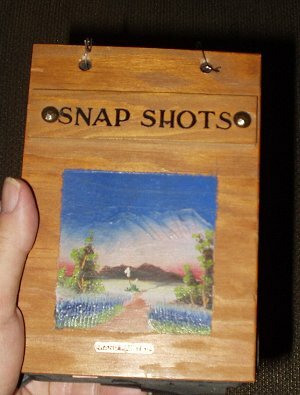 Dad’s photo album from his Army years. 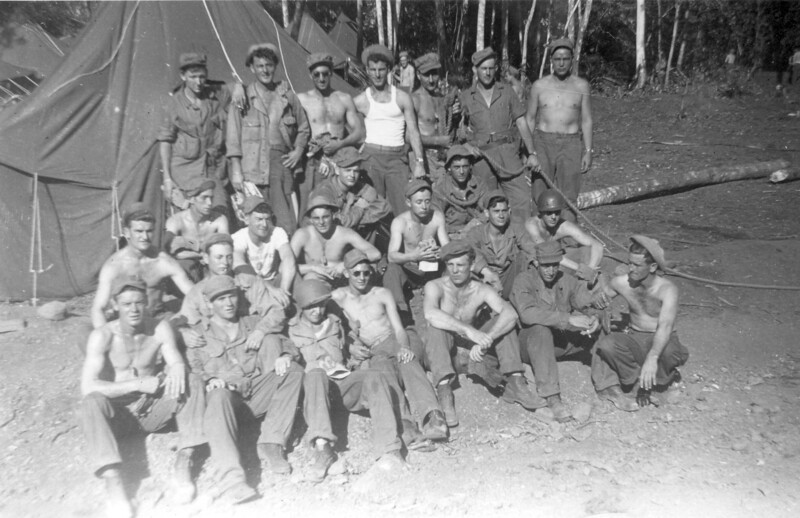 The pictures posted here and some of the ones used in my book come from my Dad’s photo album of his Army experience. Here’s a shot of the album to give some idea of what I’m working with for this project. The scans I’ve used were done some years ago, and at that point I did not document the text written on the prints. Just this week I’ve started that process-reading what is on the pictures. It gives names to the faces and a window into my Dad’s time and who he knew and where he was. There are two sets of writing on most prints; printed names, dates and locations on the front borders and neat script on the back in my Dad’s hand. It appears that the front markings may have been added later but the script is in the first person and seems timed with the images. I believe Dad was getting his film processed on or near his station and then sending the prints home. In the next post I will have more to share-the details as told by my Dad Pete about his buddies in the outfit. STAY TUNED!!! 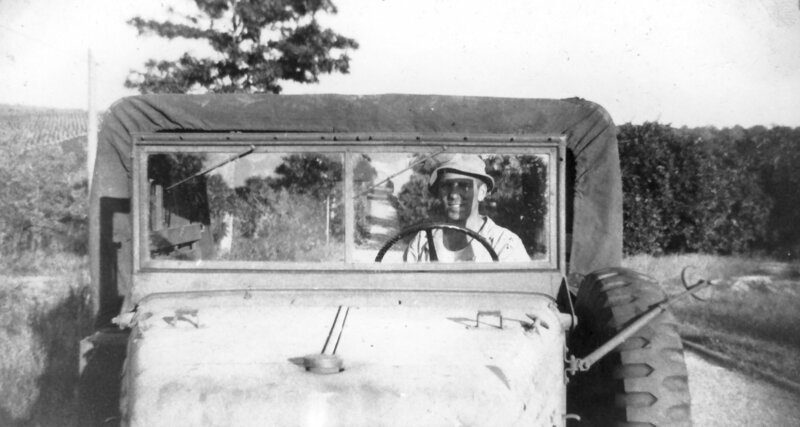 During the summer of 1943 the battalion lived and worked in central Florida. I’m adding words from the book and pictures from Dad’s album to give view of what the men were doing. Once the battalion arrived in July, they were “Placed under administrative jurisdiction of the 10th Provisional AA Group, located at Apopka, Florida; positions were taken up at Cannon Mills 30 July and in Kissimmee on 31 July. At this time plotting board personnel began training in the Synthetic Operations Room. Command procedure in new techniques were explained and practiced.” Kissimmee is now the home of Disney World!!! My dad’s section in “C” Battery were learning by doing while setting up telephone communications for the battery. 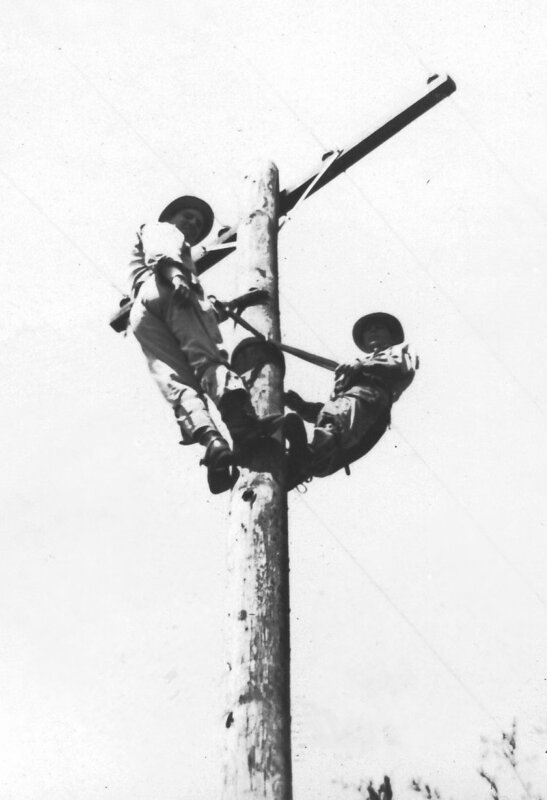 Part of this work included climbing poles. My dad said he enjoyed the challenge, but had great respect for the possible dangers of that job. Each battery had a telephone system with a simple switchboard. The crew manned the board by turn to keep the battery communications running. Check back soon for more pictures and history! C. Daniel’s WWII Page…Check it Out!!! Visit this page for cool WWII images and history! 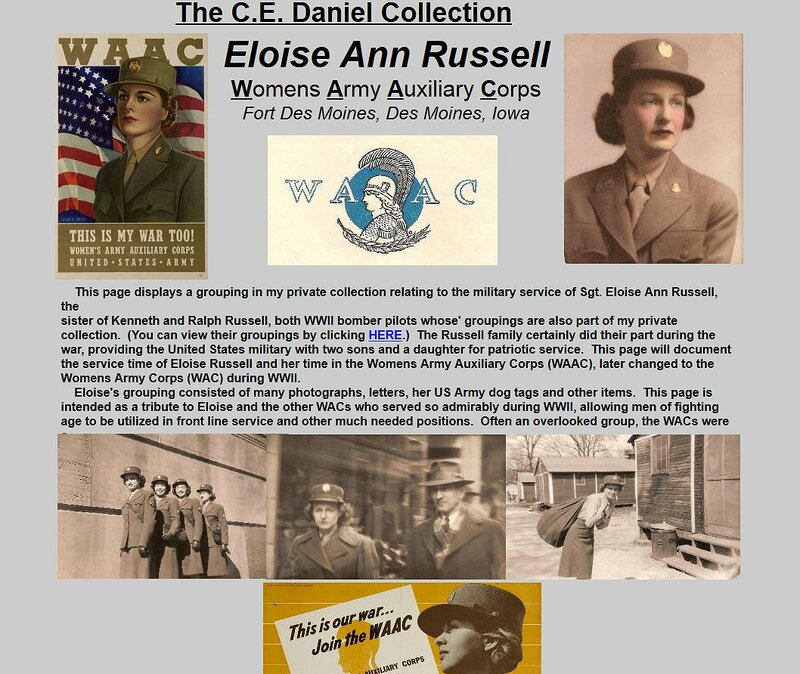 Some time ago I was doing a search for anything new on-line about the 224th…when I came across the page; “Louis M. Stark and the 224th Anti Aircraft Artillery Searchlight Battalion.” That page led me to the C.E.Daniel Collection Page with much great info about WWII. If you go to the Stark page and scroll down you will see his link to this page. A big THANKS!!! to C.
I’ve started collecting facts about the 224th from the records I have. So far they are fairly simple, but give some definition to the outline of the battalion. As I gather more information I will add them here. 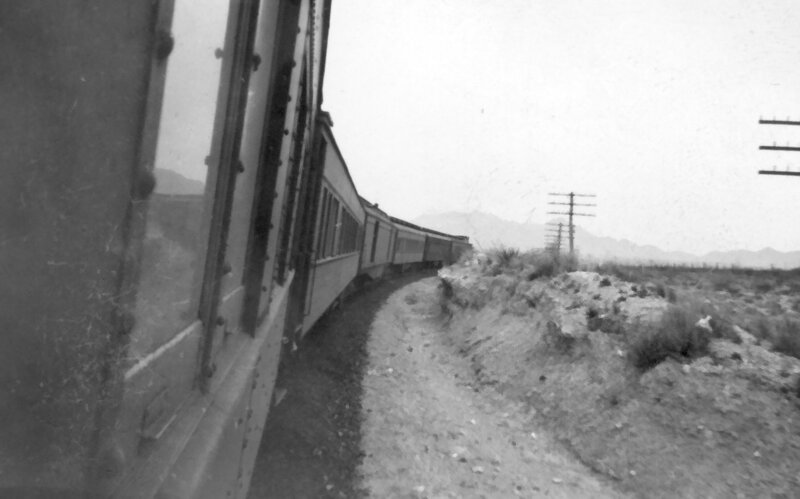 The 224th shipped from Fort Bliss by train to Orlando, Florida. They were stationed at the Army Air Force School of Applied Tactics(AAFSAT). The outfit traveled in two trains and spent four days en route. 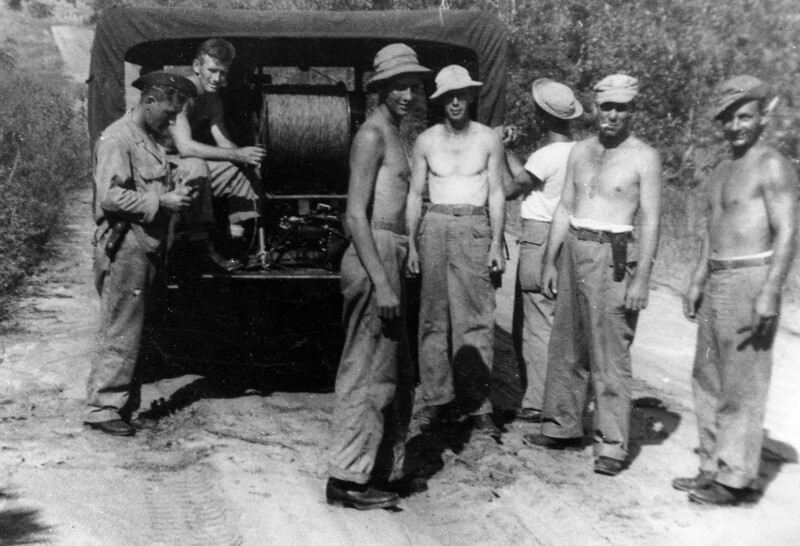 Upon arrival, the first week was devoted to basic training instruction in the newly-developed fighter-searchlight tactics. Stay tuned for more history of the 224th!